Hi dearies! The long wait is over! Finally, got the time to make this long overdue giveaway. Thank you so much for supporting Dear Kitty Kittie Kath's giveaways and for always visiting my humble blog. Four years ago, I'm just a lurker in different forums and blogs. I'm just a visitor of my favorite blogs where I learned a lot of things. I really owe those bloggers that inspired me to be where I'm now. I'm shy to say their names but for sure you also love them and follow them through all these years. 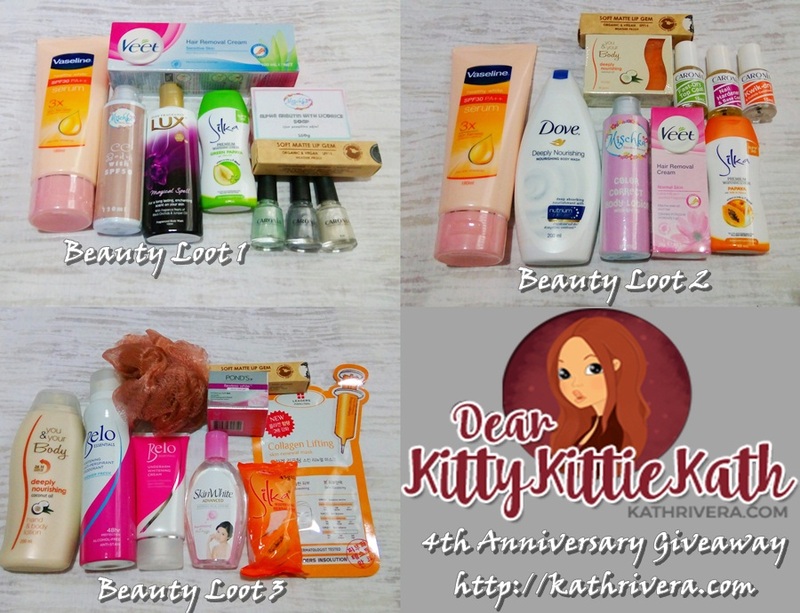 Anyhoo, for this giveaway I decided to have three winners who'll take home simple beauty loots. I'll make the mechanics simple so i do hope everyone who will join will follow what's instructed. LOG IN all your entries in the raffle copter app below. I will just make this post short and I do hope you will all join including my long time and loyal readers who made this blog a place where all discussions about beauty, fashion, lifestyle worthwhile. The giveaway will start at 12:00 midnight and will end on November 21, 2015. The winner will be announced through a blog post on November 22, 2015. What are the things you need to do in order for your entries to be qualified? KINDLY SET ALL YOUR POSTS IN PUBLIC so I can verify it. Posts in private will be disqualified. H A P P Y 4 T H A N N I V E R S A R Y ! ! ! HAPPY ANNIVERSARY !! GOD BLESS !! yay excited to your game Ms. Kitty Kittie Kath! Google + & GFC: Natalie B. Thanks for the Chance & Congratulation !!! Amazing giveaway,thank you for the chance to win it. Happy 4th Anniversary Dear Kitty Kittie Kath!